What if I told you the Democrat House Majority Leader could intentionally make untrue accusations on the floor of the Maine House of Representatives, slander the governor of Maine and 68 sitting legislators, and be treated like a hero for doing so? But bear with me for a moment and let’s take a look at the events of the past 24 hours. Thursday, the House of Representatives took up one of the more contentious votes of the session. LD 1378, a bill that would have stripped the current Governor and all future governors of their authority in the state’s bonding process. This bill and the ensuing controversy stems from Governor LePage’s reluctance to release the Lands For Maine Future bonds. But, let’s not go down a rabbit hole of whether we agree or disagree with the Governor or whether we support the LMF program. Let’s stay focused on the aforementioned falsehoods and the media’s culpability in the disseminating of such reckless falsehoods. The bill made its way through the House and Senate and was inevitably vetoed by the governor. The reconsideration of the veto was expected to be a tight vote and as usually happens in these cases a fierce debate broke out on the House floor. During this debate, Rep. McCabe falsely accused House Republicans of taking bribes and promises from the Governor in exchange for their vote to sustain the veto. Let me say that again: Rep. Jeff McCabe, the Democrat House Majority Leader falsely accused the sitting Governor of the State of Maine of bribing sitting legislators with tax dollars to get them to switch their votes. Even after being ruled out of order in the House after an objection from Republican Leader Ken Fredette, who swiftly called out Rep. McCabe for questioning the motives of Governor LePage, Rep. McCabe went on to claim there were promised “many, many things” to members of the House regarding this vote. 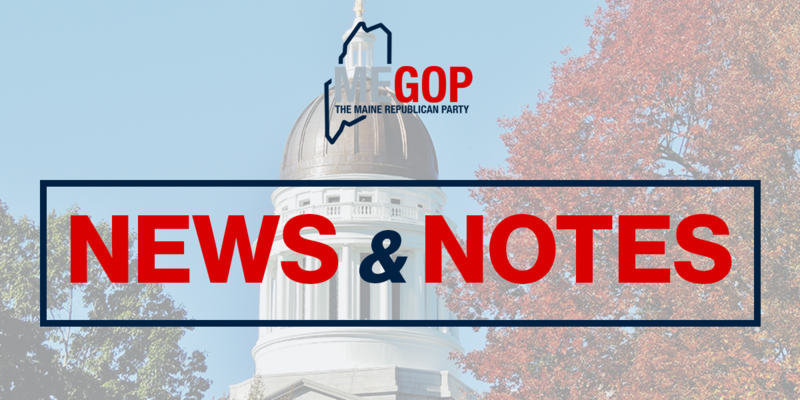 McCabe’s claims were completely unfounded, and clearly fabricated to attack Governor LePage and Republican legislators. Despite the fact that this fabricated claim was made without a shred of evidence, that did not stop the Democrats and their media friends from striking the match and starting the wildfire. • 1:00: Just moments after this reckless statement is first made on the floor of the House, Mario Moretto of the Bangor Daily News tweets the misinformation to his 2,173 followers. It’s retweeted multiple times. Among those who retweeted this lie: House Speaker Mark Eves’ Office and the Bangor Daily News. • After tweeting the slanderous statement, Moretto checks with the Governor’s office who informs him that McCabe’s statement is a complete and utter fabrication. Does Moretto find McCabe and ask him about this slanderous statement? No. And when pressed by a Republican staffer about this he states as his reason for not holding McCabe’s feet to the fire the fact that he isn’t writing about it, so it’s not a big deal. The damage is already done. When you’re allegedly a “journalist” in this day and age, tweeting is akin to shorthand reporting, especially when your statements are shared as fact by your own newspaper and top ranking government officials, such as the Speaker of the Maine House. • After all this, the Bangor Daily News still prints the lie that their reporter first irresponsibly reported without a shred of corroboration as though it were a truthful statement. There you have it, crystal clear. A road map for how the Democrat House Majority Leader can make up baseless claims on the floor of the Maine House of Representatives and instead of being rightfully criticized, be treated like a hero. This is your media in Maine. A Democrat leader makes a false claim, a reporter reports it as ‘fact’, another Democrat leader and a newspaper shares it with a larger audience as ‘fact’, a special interest advocate repeats it again to fit his narrative, and for the next 24 hours, the Democratic Party communications shop runs wild repeating and promoting a false claim. Not once does a single person, from the creator of the falsehood, to the many who hype and promote it, face any scrutiny or criticism for making defamatory statements. There is simply no accountability. Think about this when you read in the upcoming articles in the Bangor Daily News and other Maine media, especially when articles seem more based on conjecture than fact. As we have all seen in recent weeks, an attack on a Republican, no matter how baseless, quickly saturates the Maine news, but Democrats are rarely held accountable for false claims such as this. This is just more proof that Democrats know full well that they can level whatever false claims they want at Republicans, and they can count on their allies in the press to run with the attack instead of holding the Democrat accountable for not telling the truth.